With home prices off a third or more around Seattle from their hyper-inflated housing bubble levels, interest rates still hovering in the sub-five-percent range, and numerous economic fundamentals indicating a market more balanced than it has been in nearly a decade, has the perennial claim of home salesmen come true? Is now, finally, “a great time to buy”? 2005 through 2008 was definitely a pretty terrible time to buy—the signs were easy to spot: bidding wars, waived inspections, skyrocketing prices… But does dramatic improvement in market conditions for buyers necessarily mean that today is a great time? Obviously one can make an argument that there are still too many negative macro factors (unemployment, massive national debt/deficits, inflation/deflation, etc.) hanging over the market like the Sword of Damocles to make today a great time to buy, but I would like to make a different argument today. I contend that even if every possible economic and market measure were positive, it still would not be “a great time to buy,” because there is no such thing as a generic, “great time to buy” that applies to every potential homebuyer. If home prices are at rock-bottom, interest rates are at one percent, the economy is booming, is it a great time to buy? Not if you’ve got a hundred thousand dollars of school debt and you’re working part-time at the Sizzler, it isn’t! Likewise if some of the macro-economic factors are still in the toilet, but your personal situation is secure and you find a great home that you love, at a price you feel is fair, and can easily afford. Is it “a great time to buy”? Probably not, but it may indeed be your time to buy. The stuff we spend every day talking about on this site generally falls into that second category, which is only one of the many personal factors that go into determining whether or not it’s my time to buy. So, what are your factors? Is it your time to buy? I’m especially interested in hearing from readers that have bought in the last year or so. What led you to decide that now was finally the time to jump in? Doesn’t “Tolerance for risk” also fall under the second category? I would think my tolerance for risk would be less relevant if there is little to no risk of a price decline (which is what most people would consider a “good time to buy”). My husband and I bought a house in February after looking for more than a year and despairing many times that we’d never find something reasonably priced that was close to work. We had a good down payment (20%+) saved up and just didn’t want to throw it away on some craptastic place that wasn’t an improvement over our current rental townhouse. Well, we found something great, less than we were expecting to pay, and within walking distance to work. Not as walkable as our old neighborhood, but frankly I’m going to work 5 days a week, and we were walking to restaurants and stuff MAYBE 1-2 times every week. So I think this is a better situation. We’re paying less for our mortgage payment than we were for rent (including taxes and insurance!). It’s smaller than what we were planning on, but the house was just so unique and great that we’re totally OK with that. 2 months of living there and I am completely happy. It was a great time for us to buy. My wife and I decided it was “our time” to buy our first home this winter. The main reason we began looking was that we are about to start a family and want a place to settle down, remodel, paint and design. We lived in a small rented one bedroom condo for the first 2 ½ years of our marriage and with two incomes we paid off our debt and saved a significant chunk of change to purchase a home, furniture and have adequate savings left over. Our risk tolerance for a decline in home values was fairly high since we planned on living in the home we bought for as many years as possible. We ended up finding a short-sale property in Bothell that sold for about $500k in 2007 that we got for $340k. The home is a 2007 Harbor Home build and has 5 bedrooms so we have plenty of room to grow a family over the years. We were also able to find a property with a large yard in a new neighborhood which solidified our desire to move forward. On a side note, the short sale process was stressful and drawn out, but bearable. Based on what we saw over the past few months, the inventory of quality homes at fair prices is pretty thin. 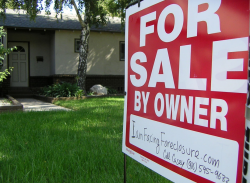 The disparity of price between owner occupied homes and bank owned or short-sale homes was vast. We looked at a mix of both and probably saw 30-40 homes total. Of the 40, there was only a handful that we perceived as a value (Priced 10%+ below recent comparables, built within last decade, large lot with big yard, desirable neighborhood, close to 405, friends, family, and church community). Our “value” list might seem excessive, but our thought was that there was no reason we should make a significant compromise since we didn’t have a time crunch and were renting month-to-month. Whether it be home ownership or buying anything, like even an automobile…..the rules are somewhat the same. If its a bag of cash to buy and you have another for emergencies too; Hades, the time could be anytime [no one said all sound financial decisions need to be investment winners, with that restriction, IMO, we’d buy nothing unti the earth depopulated….LOL]. A caveat, about 20% of WORKING Americans are now borrowing money from retirement to pay emergency expenses….that is a very unsound financial decision, especially considerring you can keep your retirements even if you default on your home loan. I think very soon I’m going to have a post indicating that I’ve bought. We’re just ironing out the final details right now. Many of the homes we’ve looked at over the three plus years I’ve been searching were bought at the same time we purchased our condo in 2003. Often I see the price the seller paid and wonder how they got such a great deal when I bought a condo because I couldn’t find a house that I liked. I think there is always the chance for a sporadic deal in any market. You just have to be in the right place at the right time. And you have to be patient. I wasn’t patient. I bought a condo instead. Right now is the right time to buy because I found a house that I like at a price a like in a location that I like. Some say prices haven’t fallen that much in the neighborhoods I’m looking at. Not true. If this house that I’m going to buy were for sale back in 2008 at this price, I would have bought it in a heartbeat. Well-priced homes sell. That doesn’t mean prices are not down. And I am ultra-picky. How can you buy at the bottom if you’re inflexible as to the type of house you want to live in? I’m going with my gut after searching for three plus years that the houses I like tend to sell pretty well. I don’t think prices are going to dip enough that I’ll regret my purchase. And now is a good time for me in my personal life. I’ve got to get on waiting lists for pre-schools. It’s a good idea to know where I’m going to be for the next several years. I would think my tolerance for risk would be less relevant if there is little to no risk of a price decline (which is what most people would consider a “good time to buy”). There’s always some risk of a price decline, unless you get a house for free. My girlfriend and I are about a week away from closing on our first house (which is actually a condo). Here are the things we factored into our equation. We currently live in the condo right next door. As in we are renting unit 304 and purchasing unit 303. We lived in the building for one year, got to know the neighbors, went to the HOA meetings, expierienced all the seasons etc. About 3/4 way through our lease the condo next to us went into foreclosure and we started thinking about whether it was the right place for us. We believe that it is, based on the trial run. The condo is in Capitol Hill. We are both in our mid-twenties, with no plans to start a family until our mid-30’s. The condo is centrally located and will be about 3 blocks from the Light Rail station when it opens in 2016. The unit we rented was an 850 sf one bedroom. The unit we are purchasing is an 1,100 sf 2 bedroom, so if economic conditions forced it upon us, we could start our family there if necesssary. We are both employed at Boeing and feel confident in our positions. The Company looks to be on an upswing in the next few years as we deliver our new airplanes and begin work on the Air Force tanker. I believe that all other things static, this is what made us feel confident in our decision. Prices are actually in a reasonable range (for Seattle I suppose) and interest rates are low. This combination allowed us to get into a right-sized condo in an awesome location for a monthly payment we could afford. The bottom line…would we pay X to live here for the next 30 years if worse came to worse came to worst. The answer was yes. I know many of the people who post on this blog (which I read regularly, but have yet to comment) say that the real estate boom is over, renting is cheaper, so on and so forth. Well, that may be true, but if you’re buying a property that you believe has good resale value, with a solid plan for life trajectory, then I still think buying can be a sound investment. I’m going to respond to your interesting take from a slightly different perspective -Because real estate is such a highly leveraged investment, the market is not as efficient on the way down. I’m sitting here in Portland and I’ve been “trying” to buy (but at a “fair” price), but there is simply not much in the way of inventory… and a lot of what is out there is still ridiculously priced. On the surface it appears that there are a lot of idiots out there who think it’s still 2007, but the reality is that they are likely over-leveraged. At the same time I constantly talk to people who want to get out of their houses (and downsize), but they “can’t right now”, so they don’t. Frustrating, but I’m sure those shills at NAR (and some of the sneering agents for new homes I’ve run into) are smiling. My girlfriend [emph. added] and I are about a week away from closing on our first house (which is actually a condo). Umm… I think we may have overlooked something in our list of determining whether or not now is a personally acceptable time to buy. – Rental rates for 1 bedroom apartments are now averaging near $1000/month and are showing no signs of leveling out in the areas that interest me. This is absent of what they charge you to park your car in the garage. – Like Tim said, it was a right time for me to buy. RE: D. in Ballard @ 5 – I don’t think there’s anything wrong with being ultra-picky, as long as you recognize the cost (time or $) that goes along with that choice. I consider myself to be in a similar situation. I just can’t justify spending tons of cash on a property that doesn’t truly fit my needs. Maybe someday those crap houses will be cheaper, or maybe I’ll have more income for a remodel, but until then I wait. Side note: nobody ever said that waiting was easy. So if anyone out there is waiting and feeling frustrated, that’s because you’re normal. my husband & i closed on a house last june – our previous landlords decided to put the condo we had been renting on the market last march. we were engaged at the time and ready to be settled in a house instead of condo/apartment, for a variety of reasons. we also wanted to stay near downtown (and houses can be expensive to rent near downtown) – so we got ourselves prequalified and looked for something we could easily afford within a 6-8 mile radius of downtown. we found a beautiful just-remodeled & fully updated house with a lower monthly mortgage payment than our rental condo payment. we only found it because it dropped $40k after the tax credit expired at the end of april and it fell into our price range. we didn’t get the $8k tax credit, but we got the house for another $10k below the list price, so a total of $50k less than what it was listed for before the tax credit expired. we did not (and still don’t) feel that we overpaid for it. the woman who owned it also owned several other properties in the neighborhood, a couple of which were headed toward foreclosure (and a couple others are still on the market, i believe). she was a motivated seller, we were motivated buyers, and we closed in 3 weeks (using FHA financing, even!). we’re coming up on a year living there and couldn’t be happier. the only unexpected maintenance expense we’ve had so far is a clogged main sewer line. so yes – it was definitely the right time to buy for us. We bought in March a downtown condo that was about 15X our rental payment (before our rent was to go up 10%). We ended up with a nicer place than we rented, 200 more sq. ft, better layout, decent view, 2 parking spots, dog friendly, downtown, etc. With a 3.8% 15 year mortgage, we’ll have it entirely paid off before retirement. It might not be the best investment comparatively speaking, but we don’t think it will decrease substantially. Not having to deal with real estate every year is a big plus. I don’t plan on buying for at least 4 more years. Not in Seattle area. But I enjoy your site a lot! Based on the responses above apparently last fall and early this winter were great times to buy. And I hear you can get a screaming deal on a condo right now. The new bottom is in. Feed a realtor- buy a condo! My Wife and I want to start a family and have been looking since Dec and have been really disappointed with the lack of good inventory on the market. We finally found a short sale we were interested in last month. We set up a showing with our agent, walked into the house (that was only 2 years old) and were shocked at the condition. Nice hardwood floors were destroyed and needed to be completely refinished (it looks like they were playing with the dogs inside). The carpets had black stains (looked like grease) all over them, and the walls had stains and some “dents” in them. The kitchen, looked like it was in good shape till I tried to open one of the cabinets and it almost fell off. Oh, and the smell… it was something else. Keep in mind, this house is only 2 years old! The occupents are still living there. So we put an offer in @ 15% below what the current asking price (most of the fixing is cosmetic), and the sellers agent wouldn’t even present it to the bank! So we waited… 1 month later, and 60 days on the market, and the house hasn’t had an offer. The time was right for us. We purchased our first home this last winter in the Mt. Baker neighborhood of Seattle and have been very happy with the decision. Our mortgage is $500 a month more than our previous nearby rental, and we have twice the square footage and are much closer to Lake Washington (5 minute walk). We’re locked in for 30 years at 4.875% and have more than enough bedrooms to accommodate for the kids that my spouse and I plan on having. The down payment was provided mostly from gains in the stock market (for those of you not keeping track, the S&P 500 is up almost 100% from the low in March 09). We were buying stock when everyone else was running scared in early 2009 and we made out very well. And now everyone is scared to buy a house…..
I’m sure homes will more than double over the next 3 years as the Fed pulls liquidity from the equities market and pumps it into housing. Unless they plan to pump it into cheap treasuries purchased from the Chinese. I think its great that all of you bought and still check in here. The Bubbleheads are GROWING in numbers and are ALWAYS the most educated Buyers. Great work Tim keeping this site together even after the New Employment at Red Fin. Its also great to see everyone here is so happy with their purchase. What did your Agent tell you? As with any seller specific instructions can be given to the listing Agent that is hired. Could it be that your offer was too low? Nice post Tim… excellent point about individual level factors and considerations. People like to think about economics being a hard science, but it is really a social science based upon individuals and subjective judgements. “Opportunity cost” is really hard to measure but perhaps one of the most important elements of market theory. “What’s this house/property worth to me…” vs. ??? I think some banks had to pay people to take away certain foreclosures in detroit… so free still doesn’t mean no financial risk. RE: Scotsman @ 18 – Maybe now is a good time to put that dump you make your mother live in on the market. So, it is true, that it is always a good time to buy Real Estate! Our situation is not absolutely perfect to buy but it is close enough. So we are going to start seriously looking towards the end of summer. I am disappointed at the selection out there but we are not in a total rush. I have kids and renting was okay for awhile but we are so done with renting. I trust that the right house will be there. If you’ve got a couple extra $million laying around she’d probably sell it to you. It’d be a nice step up from White Center. Be sure to set something aside for the obligatory new boat. Admit it. That saying originally came out of the lips of a beautiful female redfin sales agent last week at your lunch table. Next time you see her, ask her how far underwater she is on the house she purchased in 2007. From a barber’s perspective, it’s always a good time to get a haircut, From a real estate agent’s perspective, it’s always a good time to buy a house. For me, it was obvious five years ago that local home prices were seriously overpriced. Still, there were a lot of homes for sale, and if you had the money and a very long term perspective, you could buy a home and be happy in it. Now, it’s less obvious to me as to what the housing market is going to do. I think it’s going to be flat to slightly down for the next couple of years, but I don’t really know. I do know that there’s a lot of garbage on the market right now. I’ve discouraged people from buying houses in the past( great sales technique, huh?) because prices were almost guaranteed to fall. But there’s something very satisfying to a lot of people about owning a house, and not everything worth doing is strictly a financial decision. The problem with buying a couple $million house is when the price goes down 20%, you lose your shorts. OTOH, if you buy a house for $400K, you probably don’t have to worry as much. My girlfriend and I keep jumping back and forth between buying a cheaper (safer) house and the house we really want (with an outrageous beach but nowhere near a couple $million). It’s not an easy decision to make in a strange economy such as ours. In fact, it’s downright scary. I smell a sellout. I hope a lot of money was involved. If the macro environment is even half as risky as the regulars here constantly point out, in 4 years all these buyers will be back crying about how they were scooged. And saying “where’s my bailout”? Are you really sure now is an acceptable time for you to buy? Have you thought through all of the possible scenarios involving owning real estate with a girlfriend? I’m not sure one can say whether it was the right time until 3, maybe even 5 or 10, years have passed. Did you enjoy the place and really use it? Was the commute tolerable? Did it feel like a good value after living there? Were you happy with the neighborhood? Was the mortgage ever a stretch to service? Did you turn down job offers because you couldn’t leave? Was maintenance what you expected? At purchase time it seems like the right time.. for everyone. These questions decide whether it really was, and none of them can be answered for at least a few years after buying. Admit it. That saying originally came out of the lips of a beautiful female redfin sales agent last week at your lunch table. You guys seriously crack me up. I write a post in which I say that even if home prices are at rock-bottom, it may not be a good time to buy, and I follow it up with a comment about how there is always some risk of a price decline, and you guys accuse me of spouting sales speak and selling out. RE: Scotsman @ 25 – At that price it is stale before you even put it on the market. More delusions. RE: Mikal @ 35 – Oh spelling Nazi, if you are so smart, why didn’t you list it in early 2007? Because it is always a great time to buy Real Estate, if you buy well. Your premise is the same as if saying that payments are low, due to low interest rates, so it may be a good time to buy if those payments fit into your budget. However, Real Estate is an investment. Buying a home is a part of people’s portfolio. Broad statements about what amounts to, if it feels right then you should proceed, is sales talk. From the amount of information out there about the investment aspects of buying a home this is one of the worst decisions a family can make. There are good deals in the market today, just very, very few. Most “deals” are on properties most people don’t want. Tim, ask Glenn about his purchase in 2010. Ugggh..Per Zillow he is already upside down nearly 300k. He should spend more time reading Bubble! Because it’s not my house to list? Are you pfft’s brother? I see a similar pattern of behavior. Yep. This is the trick. My wife and I had a plan that turned out to be useless: 1) Purchase a 1 Br condo in 2008 with 20%+ down. 2) In 2012 complete my Ph.D., sell the condo and move to a more spacious home and begin a family. I am on pace to complete the Ph. D., but now we will be lucky to be out by 2015. We will begin a family in less than ideal conditions – though not bad, by any means. It wasn’t until the market corrected that we realized 2008 was a terrible time to buy. It takes hindsight to determine the appropriateness of the timing, which makes a long-term, highly-leveraged investment like a home purchase a crap-shoot. I don’t think it will be a great time to by for me, all things being equal, until I have something like 50% down or more and the ability to handle a 15-year mortgage and a long-term commitment to a particular location. The more transient society becomes, the less wise it is to carry a mortgage without significant wiggle-room built in. I’ve said for some time home ownership would become a luxury only the wealthy could afford. Wait until the property taxes on the “rich” get pumped up to support failing public pensions, crumbling infrastructure, etc. And who else will be able to absorb the ongoing capital depreciation? Will tax liens mean the cities become landlords for the masses as the resale market ceases to exist? What’s wrong with buying real estate with one’s boyfriend or girlfriend, my dudes? The words don’t necessarily imply unseriousness or lack of commitment. Some committed heterosexuals (hi) are not interested in getting married and perfectly willing to work with a lawyer to hammer out fair contracts related to the house and its care and finance. Some people with committed boyfriends and girlfriends are not heterosexuals hence cannot get married in Washington State. I can also be on topic: I suspect my BOYFRIEND and I will start looking to buy, desultorily but with a willingness to be surprised, this coming fall. Whenever we do buy, prices may yet come down, but we’ll have been able to swing a down payment in excess of 20% and a 15-year mortgage, the latter long our goal. We’ll be able to maintain a large emergency reserve, and we both have stable, enjoyable jobs and intend to stay in the area indefinitely. I am weary of renting; I want to build custom shelving and put up wallpaper, and said boyfriend wants to garden and experiment with graywater systems and solar energy. We would both like to enjoy the rewards of our industriousness, caution, and research over the last several years. For me anyway, there will come a time when the perfect becomes the enemy of the good. Of course, my current sentiment is subject to change (as is, I know, my current evaluation of our collective job security, etc.). The nice part is that as long as we’re renting, we have options. Desponder, congrats on your soon-to-be Ph.D.! I forgot to add that in your situation you have already taken a leveraged position. At some point your loan will amortize quickly. That is the point some investors make about having a renter pay for the mortgage. There are strategies for you. There are a lot of strategies in Real Estate. You may have to do some averaging by making a better “deal” on the next purchase. Look forward. You have the experience now to be cautious. After selling our first house in August 2009 for slightly more than we paid in March 2004, we rented for a year and bought again in December 2010. It was the right time for us because our son will be entering kindergarten this year and we wanted stability. We have 2 incomes and plenty of savings. But, having said that, the market was telling us to buy as well. We paid 30% less than the house was originally listed for, and locked in a really good fixed rate. Sure, the market has continued to suffer since December, but I’m planning to stay in the house for 15 years, so none of the near-term variation really matters. RE: Scotsman @ 39 – Are you Bush’s brother? Lets cut taxes and fight two wars. For dumb. Why? We’ve got a better deal now- cut taxes and fight THREE wars while totally tanking the economy! BHO makes Bush look like an amateur. All the presidents make Bush look like an amateur. What’s wrong with buying property with one’s boyfriend or girlfriend? Nothing. People do it all the time. My wife and I bought out first house together before we were married, and stayed unmarried for many years after that. I was the buyer’s agent in a recent house deal in which the buyers were an unmarried couple. It’s just not a big deal. Sure, if an unmarried couple breaks up, dividing the assets could become problematic. And you know what? When a married couple breaks up, dividing the assets could become problematic. Have you thought through all of the possible scenarios involving owning real estate with a girlfriend? After waiting for years for the Portland market to go down, my boyfriend (of 14 years) and I just bought a foreclosure for super cheap–$138k. While it’s true that most of the low end is pretty grungy, this house was in pretty good shape and it’s in a nice neighborhood. I’ve been reading this blog and the Portland Housing blog for the last 14 months, and, while it’s put the fear of god in me, it’s also been incredibly educational and given me a broader understanding of economics. I will probably continue to be freaked out about things like stagflation and the possibility of house prices dropping another 20%, but I also want to move on with my life and grow tomatoes and finally be able to get a cat and paint the walls whatever color I want. I embark on this choice with open eyes, thanks in part to your blog. I believe this is a Haiku? Such Beautiful words. Kinda puts it all in perspective. This blog should be renamed the SeattleBottom. We weren’t even looking to buy yet, but accidently stumbled across something close to my dream property at a great price (foreclosure). We had the cash, and then some, so I we went ahead and got it. Plan stay for 10-12 years +. I know this hasn’t been commented on in a while…but this is precisely something I am considering now! I’m in Southern California…and while we’re in a good financial situation to buy….I’d absolutely be kicking myself if the bottom fell out of this bubble we’re in. So is it the “right time….”? It could certainly be “a time,” but I want to feel like I’m buying at the best time possible. And since the last comment on this post…things have just gone up and up and up. Don’t try to catch a falling knife. Wait till it sticks in the floor and pick it up. If the rents are not substantially cheaper than the mortgage you’d be paying for the same area your downside you’re in an ok time to buy. It may not be the bottom but it won’t be the top. If rents are say more than 20% cheaper and you dont need to buy then don’t. Outside of that your guess is as good as the next persons. RE: boater @ 60 – I wouldn’t even try to give advice on another market. But the don’t catch a falling knife advice didn’t work so well up here, or any other advice given here. It was the beginning of April 2012 when I wrote my “Significant Market Shift” blog-piece. That wasn’t advice to buy, but instead just noting it was easier for move-up buyers to sell a house after buying. So the key was the activity on the listing side. Just looking at price action is somewhat pointless because by the time you know it’s not just a temporary move it’s too late! But applied to any other time or any other place there’s no guarantee that the same type of change in the listing market would lead to the same result. Rather unlikely probably. Our rent is about $3000. If you put 20% down on a place like this, mortgage would be $3800. I’m really curious what rising rates will do to the market. Will it just make it harder for me to buy a home…or will it have an affect on overall prices?